A 5.1-magnitude earthquake struck La Habra in northern Orange County on Friday evening, causing minor damage to buildings, gas and water main breaks, and some street flooding, but no injuries. It was felt as far south as San Diego. The temblor hit at 9:09 p.m. Friday at a depth of five miles, one mile east of La Habra, and was preceded by a magnitude 3.6 quake in the area at 8:03 p.m., according to the U.S. Geological Survey. 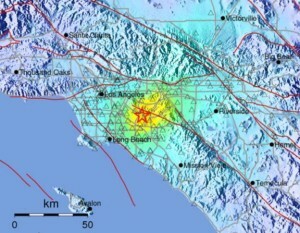 Computer-generated shake map from the United States Geological Survey shows where the quake’s impact was greatest. 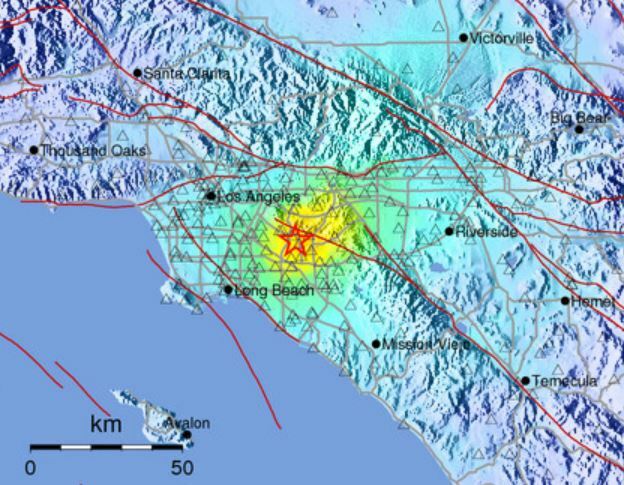 The earthquake was felt from the Mexico border to the Central Valley in at least seven Southern California counties, including Los Angeles, Orange, Riverside, San Bernardino, San Diego, Ventura and Kern. A lieutenant at the San Diego County Sheriff’s Department said residents reported feeling the earthquake in North County and as far south as Mission Valley. The temblor was followed by about 40 aftershocks, two greater than magnitude 3.0, USGS seismologist Robert Graves said. There were no reports of surface rupture, Graves said. In La Habra, police received multiple reports of broken windows and gas was shut off in one area as a precautionary measure, according to police spokeswoman Cindy Knapp. Police and city building officials in La Habra were also investigating possible structural damage to three apartment complexes, Knapp said. Residents were evacuated but, so far, no buildings have been red-tagged. The Red Cross opened a shelter at the La Habra Community Center, she said, and about 50 residents came to the center but many have since left. Knapp also told NBC4 that the city has had three water main breaks, but said no injuries were reported. NBC4 also reported six water main breaks in the city of Fullerton. In Brea, the quake caused a rock slide which overturned a car and blocked Carbon Canyon Road, according to authorities. Southern California Edison reported that 1,748 customers in the La Mirada area lost power. Edison spokeswoman Susan Cox said the outage, which occurred at 9:11 p.m., was most likely related to the earthquake. The Los Angeles County Fire Department received reports of gas leaks in the Rowland Heights area and scattered minor damage, said department supervisor Ed Pickett. The Los Angeles police and fire departments conducted an assessment and reported no damage in the city, Mayor Eric Garcetti said. Disneyland shut down rides as a precaution, NBC4 reported.